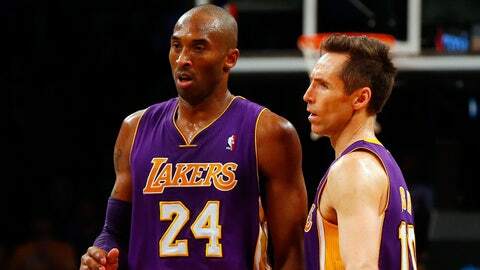 The Lakers could see money in return from the absences of Kobe Bryant and Steve Nash. Kobe Bryant and Steve Nash have each played six games this season, making the Lakers’ medical-insurance options more interesting than usual. The Lakers are short on victories but might get some money back from the absences of Nash and Bryant. If a player misses 41 games in a season, medical insurance covers 80 percent of his missed time after that. Bryant and Nash sat out their 27th game Friday. Neither player is expected to return for several weeks, Nash because of recurring back soreness and Bryant because of a fractured left knee. It’s been the hardest thing I’ve faced in my career. Emotionally the battle is worse than the physical battle. But if Nash missed the rest of the season, the Lakers would get back about $3 million of his $9.3-million salary. Bryant is much more likely to return than Nash, but the Lakers would pocket about $10 million if he missed the rest of the season. The medical rebates would not help the Lakers for salary cap or luxury tax purposes. The Lakers, of course, want Bryant and Nash to return. A team official said it was foolish to think medical money instead of victories at this point. Nash, who turns 40 next month, has been traveling back and forth to his personal trainer in Vancouver, Canada, trying to add enough strength and find the right physical balance to play again this season. "I still love it enough that I want to do it badly," Nash said Friday. "I feel like I’ve been so close ever since September but never gotten over the hump. It’s been the hardest thing I’ve faced in my career. Emotionally the battle is worse than the physical battle." The Lakers hope he can play Jan. 28 against Indiana, but if his training doesn’t go well in Vancouver, Nash said the rest of the season could be in jeopardy. "If it’s the same old, it’s probably another month or something of trying to come back … and then what’s left of the season?" he said. "I definitely realize we’re up against a deadline here to get healthy." Nash is under contract next season as well, the final part of a three-year, $28-million deal he received when the Lakers acquired him in a sign-and-trade with Phoenix. That deal cost the Lakers two first-round draft picks and two second-round draft picks. Interestingly, because of Bryant’s recent medical history, there’s no guarantee the NBA’s medical-insurance providers will agree to insure him next season, the first part of his two-year, $48.5-million contract extension. The insurance providers have the right to decline coverage for players in certain situations. In other words, if Bryant misses substantial time next season, the Lakers might be solely responsible for paying him.